Facebook claims to have Twitter “in the rear-view mirror,” but of course the company is keeping a close eye on what’s happening with Twitter. The recent inclusion of Twitter-style tagging with the @-symbol in Facebook certainly seems more than a little inspired by Twitter. There is one thing we find a wee bit strange, though. Although we love Twitter and the service is clearly growing like crazy, the way people are talking about Twitter and Facebook often makes it sound like Twitter may overtake Facebook any day now. Those people need to realize how big Facebook really is. 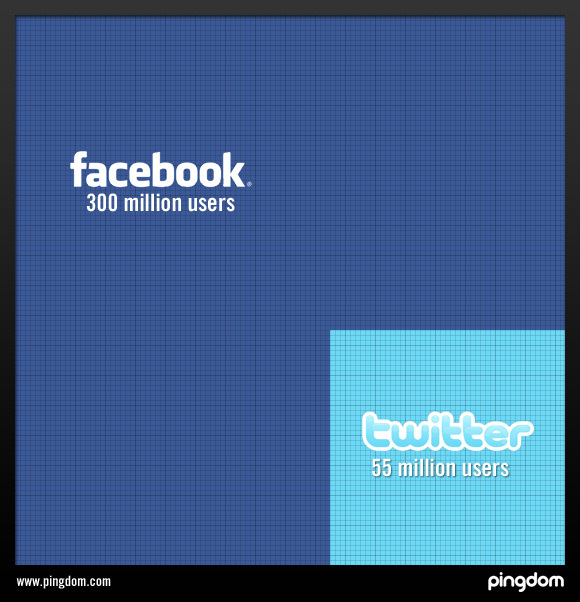 We are talking about 300 million active users on Facebook versus somewhere around 55 million active users on Twitter. In other words, Facebook has a user base almost six times as large as that of Twitter. We’d like to point out that the Twitter number is only an estimate because Twitter hasn’t made any user counts public. 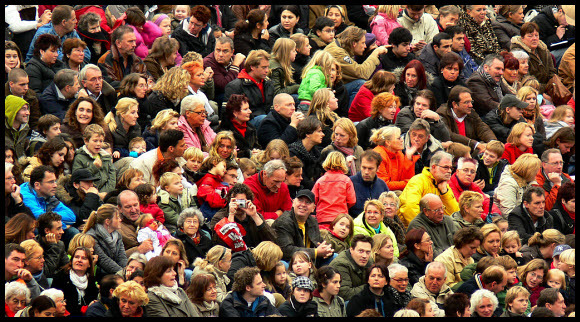 What we do know is that Twitter.com had 55 million unique visitors in August according to Comscore. Not all of those visitors will be actual users, but on the other hand the Comscore number doesn’t include people who use Twitter via third-party applications, something we hope evens things out somewhat. Twitter has certainly been growing extremely fast in 2009. Its popularity has more or less exploded. If you look at Twitter’s growth rate in percent, it has probably beaten every single site out there in 2009. But when it comes to actual, absolute numbers, Facebook is on fire. On July 15, Facebook announced that it had 250 million active users, and on September 15, two months later, it had reached 300 million users. Facebook grew by 50 million users, roughly the equivalent of an entire Twitter, in just two months. If you do the math on Facebook’s reported numbers, the service has been growing by an average of 806,000 users PER DAY lately, or around 24-25 million new users per month. So, Twitter is growing fast, but in terms of absolute growth numbers it looks like Facebook is killing most sites out there right now (if not ALL sites) and this even includes sites as popular as Twitter. We feel that comparing Twitter and Facebook directly like this is a bit like comparing apples and oranges. The services are quite different and fill different needs, and there is bound to be a lot of user overlap between them since many use both. In our opinion there certainly is room for both and there is no reason why both can’t be successful in parallel. But at least for now and for the foreseeable future, Facebook is king of the hill by a wide margin in terms of sheer user numbers. Photo credit: Crowd picture by Pieter Musterd.